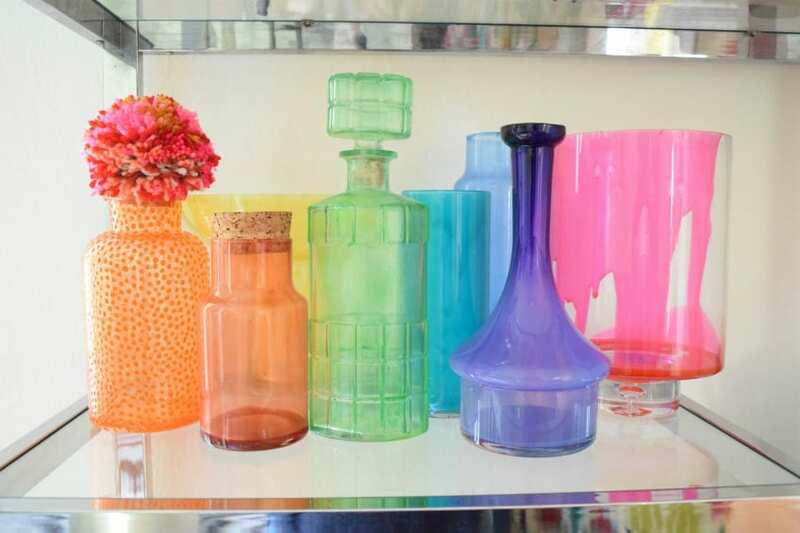 My collection of colorful vintage glass vases happened by accident. 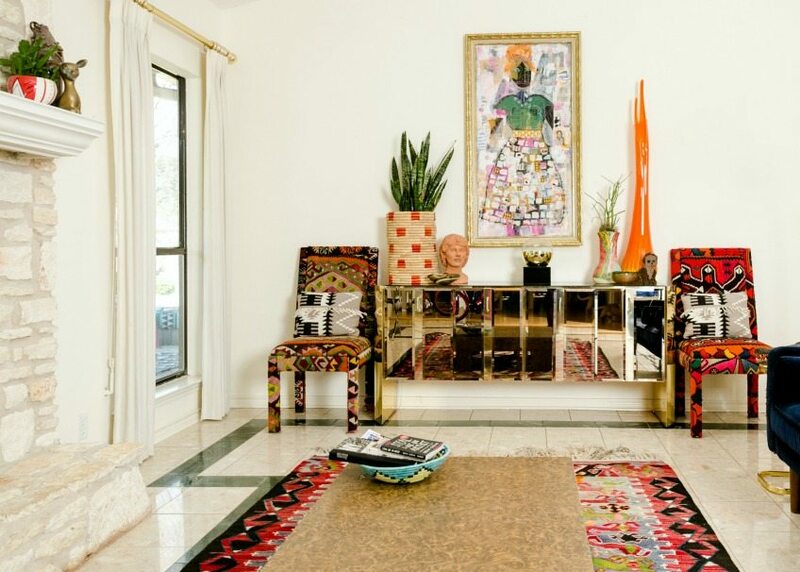 I would inherit a Viking Glass vase here, be gifted a tall Italian glass genie bottle there and one of my first collections as an adult were Murano glass ashtrays. Now that my collection is relatively large, I’m thankful for all the gifted glass. 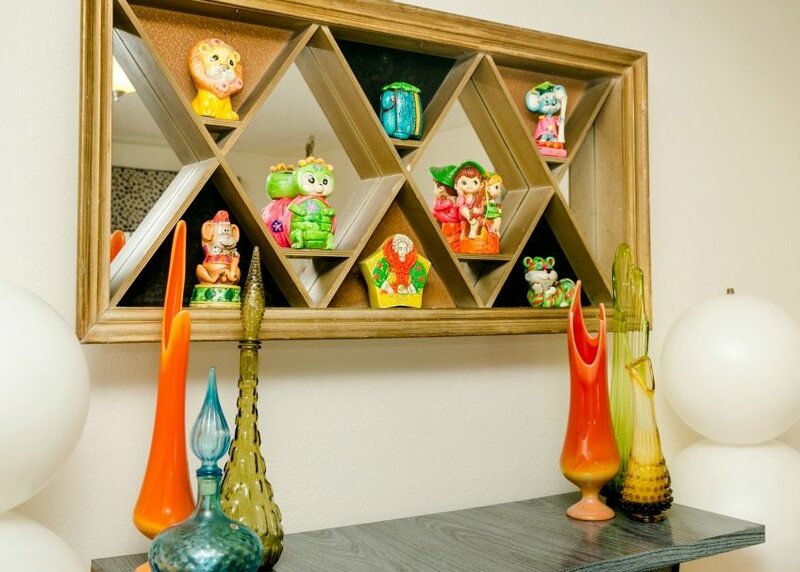 I’m always adding to my collection and from time to time I DIY my own colorful vintage inspired glass pieces. I love the organic groovy shape of these tall vintage glass vases. Some actually have lids and look like genie bottles, those are my favorites. They are great styling pieces and work amazingly getting rotated in with Halloween and Christmas seasonal decor. Sometimes I sprinkle mine around the house, other times I group them. From time to time I will find new pieces of colorful glass to supplement my rainbow. As in like brand new from the store. 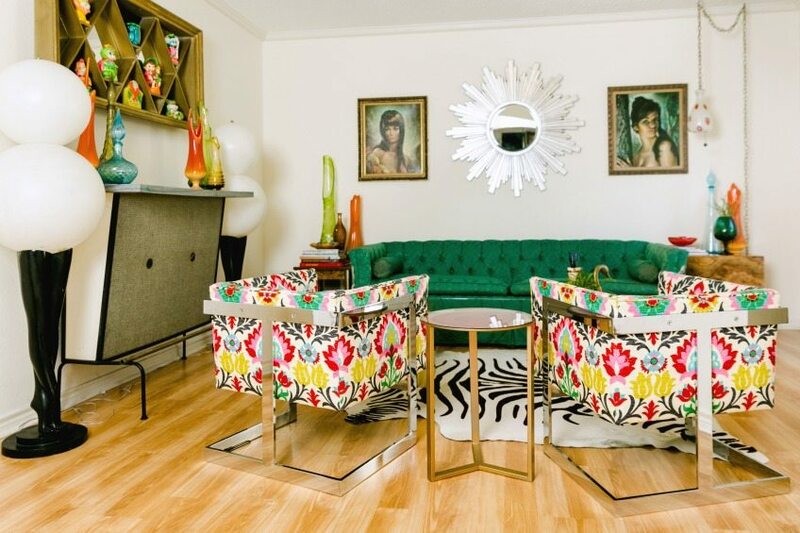 Check out these vintage inspired home decor trends and see where I picked up a few of these vases, decanters and colorful brandy sniffers. Hint: they didn’t all come from a flea market or antique shop. Sometimes with enough vintage pieces you can smuggle in a few new items and even DIY ones that fit right into a collection. Speaking of a DIY can you believe all of these vases, jars and decanters were clear glass when I picked them up at the thrift store? 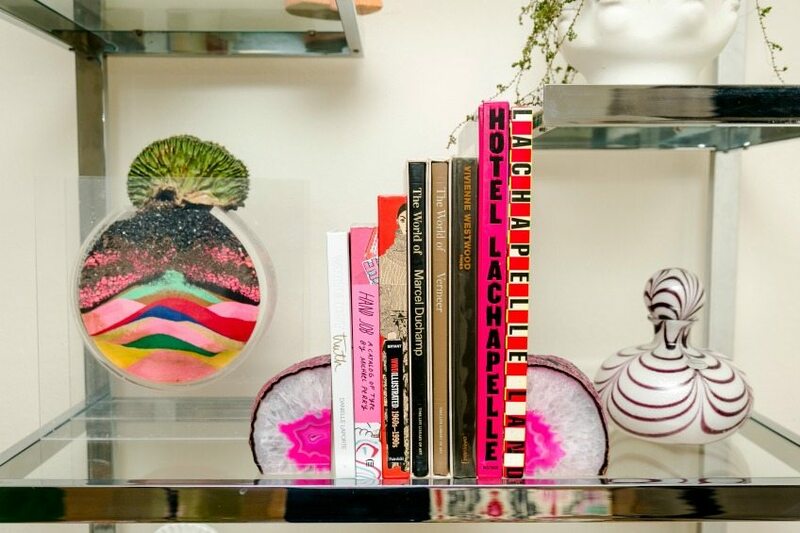 Stroll down the aisles of your favorite second hand shop and take a peak at the glass aisle and start seeing everything in color instead of clear. Choose your pieces based on unique shapes and varying sizes. All that is left is to color them so they look like actual pieces of vintage colored glass. Check out this episode of DIY This With Jennifer Perkins where I share everything you need to know for tinting glass. AKA turning old flower vases from the thrift store into perfect additions to your expensive vintage Italian glass collection. Grab the glass paint and food coloring and check it out. Now if only I could figure out how to DIY vintage Murano glass like this decanter and get patterns, spots and stripes. Murano is my first glass love. As I mentioned I collected vintage Murano glass ashtrays in my 20’s and amassed a large collection long before midcentury became a household word and their prices went sky high. This decanter is one of my favorite non-ashtray pieces. Another rare piece in my Murano collection is my groovy vintage swag lamp. Dig those polka dots and sparkly white glass! I’ve had this light since college and still love it now when I’m saving for my own kids college! 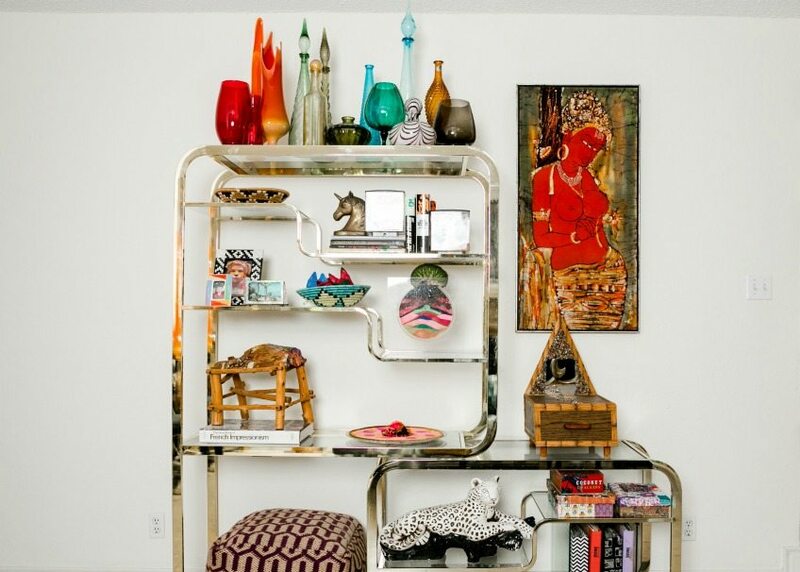 I’m constantly changing the look of this room and currently it is home to most of my vintage glass collection. This giant orange Fayette Slag glass vase was a gift from my Mother-in-Law to her parents when she graduated from college. Now I am the proud, and I mean REALLY proud owner. 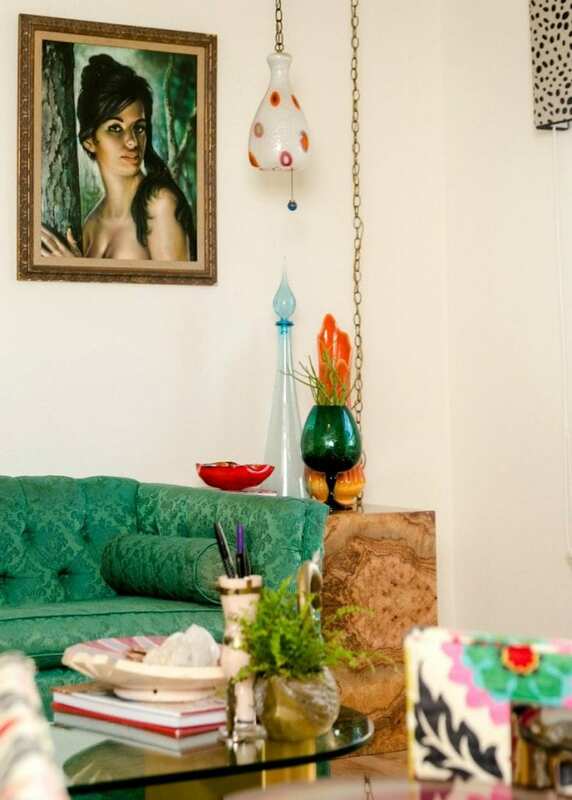 This super tall vase (probably close to 4 feet) started my love of vintage orange swung glass. The pieces all appear to be slightly different with the same persimmon orange color. See look here is a little footed Viking Fayette glass vase. 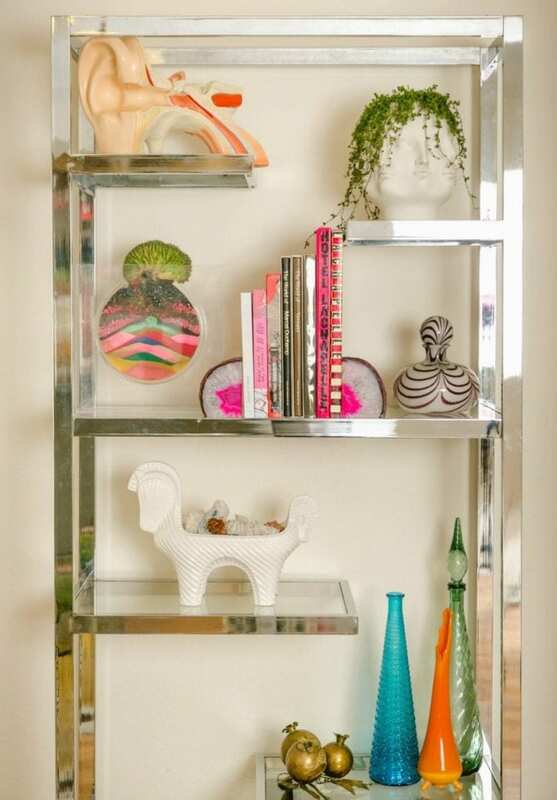 They come in all shapes and sizes and play so nicely with all my other tall Italian glass vases and etagere goodies. Want to see more pictures of my vintage glass collection? I have home tours on Houzz and a video tour here on the blog where you can spot some things! I’m the first to admit I don’t know a piece of Viking glass from an Le Smith vase or Fireking from Hobnail. I just know if I like it. Chances are if it is tall stretched glass vintage vase I am going to like it. Probably love it if it also comes with a lid and looks like a genie jar! What about you? Suddenly have the urge to start your own collection? 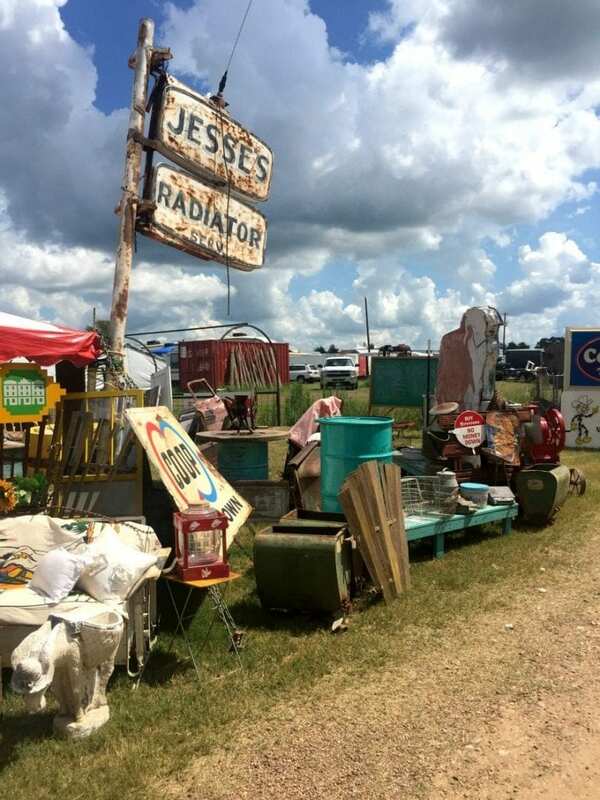 Everything You Ever Wanted To Know About the Round Top Flea Market – My home away from home right outside of Austin and where I snag a LOT of vintage glass pieces for my collection. 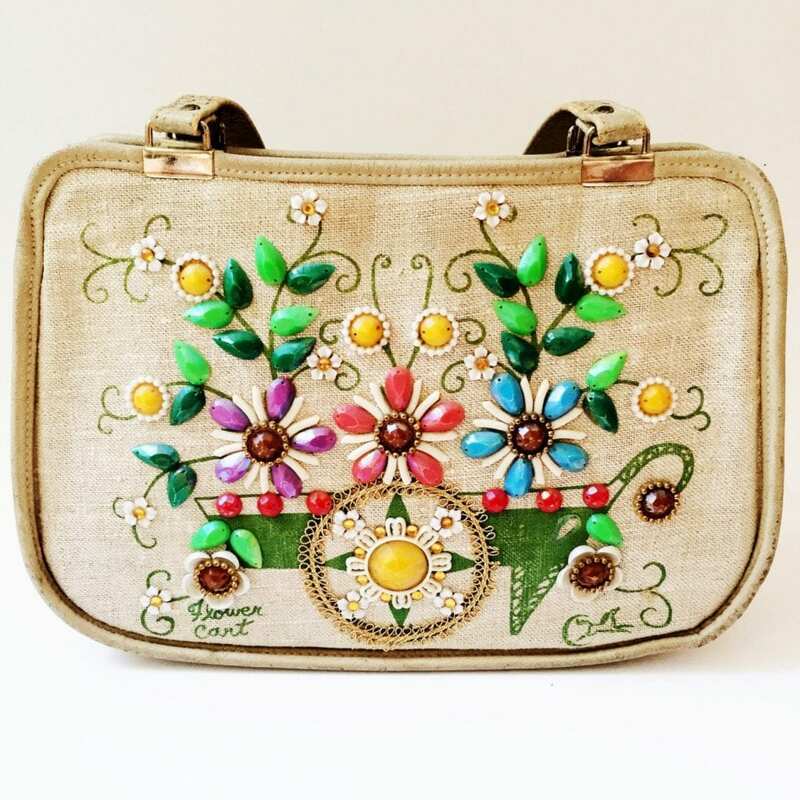 Enid Collins a Crafty Entrepreneur and Texas Legend – Another one of my early vintage collections were Enid Collins purses. The colors, the kitsch, the names – what is not to love! 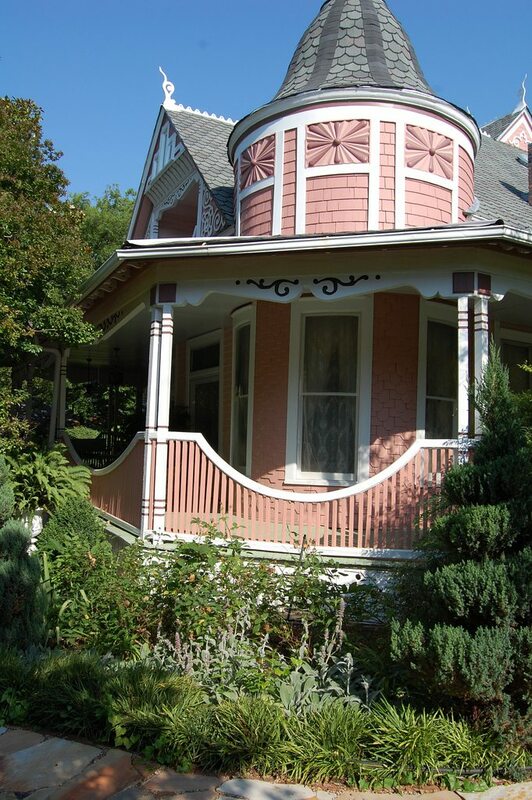 Pink Victorian Home Tour – If you think I have a lot of collections, you should see my parents 128 year old pink Victorian home full of antiques. Posted May 22, 2018 & filed under Articles, Crafts, Home Décor Crafts.